If you are getting a little tired of reading the same old stuff about dieting and exercise to lose weight, well there are other options you can try that are not always so well covered elsewhere. These are the more unusual, but equally valid ways of shedding those excess pounds to improve your health and fitness to look and feel better. One of the best ways to give your health a real boost and a really good habit changing tip for losing weight is to stop drinking soda and instead, switch to drinking plain water. And lots of it! Health recommendations say that adults should drink around 8 glasses of water per day to keep the body hydrated to the correct level. Often, when you think you are hungry and reach for the high calorie snacks, you are not really hungry but thirsty. Your brain just gets the messages wrong and out of habit, you tend to reach for something to eat. Try training yourself to switch to grabbing a glass of water whenever you feel hungry in between meals. 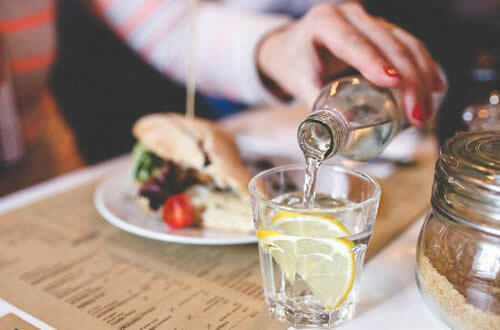 You will often find that once you have drunk the water, that feeling of hunger is abated and you get to avoid loading up on calories while looking after your body's health! Another way to improve health and lose some of that excess fat at the same time is to change some lazy habits for healthy ones. When faced with a choice of a flight of stairs or an elevator, choose the stairs every time. You'll soon start feeling stronger and have more energy while burning off some extra calories. Instead of parking your car right outside a store, park further away so you are forced to walk some. In fact, if the stores are close enough to your home, why not walk all the way and save money on gas? Did you know that more people walk to better health than you would imagine? Walking is great exercise and it's something that doesn't even feel like exercise! When was the last time you enjoyed a swim? If it was ages ago, then give yourself a treat and go to the local pool and swim some lengths then have a splash around and have a good time! Do you own a bicycle? Have you used it lately? If you have one but don't use it, then surely it's time to get it out of the garage and go for a ride around your neighborhood, because cycling is healthy and very good for you! If you are going to the store for food, eat something before you go. Shopping for food on an empty stomach makes us grab stuff we wouldn't otherwise buy and that is often high calorie snacks! Working with diets and losing weight is all about not eating the things that will make you gain it. If you don't buy them, you are not going to eat them! If you know where to look, it is possible to save money on online diet programs, even the really big, popular ones. For example, you can grab a Nutrisystem discount code that will save you money off the regular price when you click that link. The same applies to many other diet programs that can be found online. Finding them is easier than you may think and it's another simple way of getting on a weight reduction program without it costing you an arm and a leg. Well, there are some of the more unusual tips for weight loss, health and staying fit that you can try to add into your daily routine and have a little fun losing weight and getting fitter by walking on the wild side of the street!